This document shows how to set up new environment on Amazon Web Services (AWS). 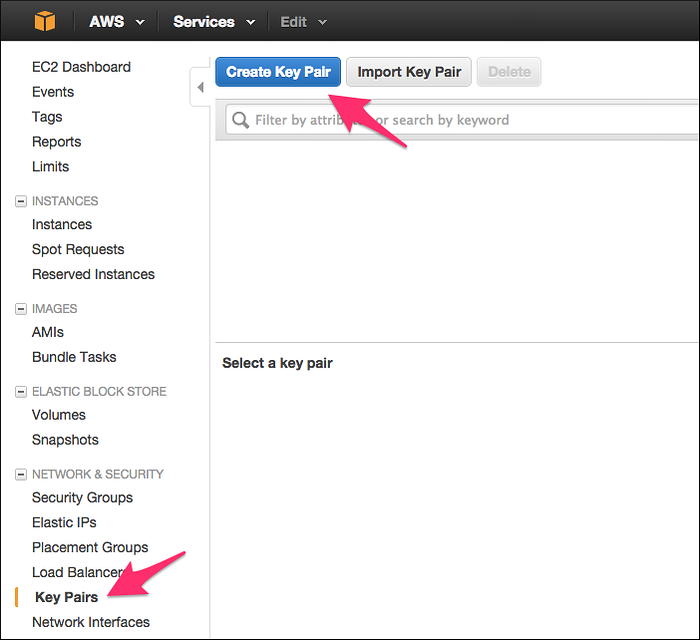 Your AWS credentials consist of an Access Key ID and a Secret Access Key. Follow Creating IAM Users to create a new IAM user. 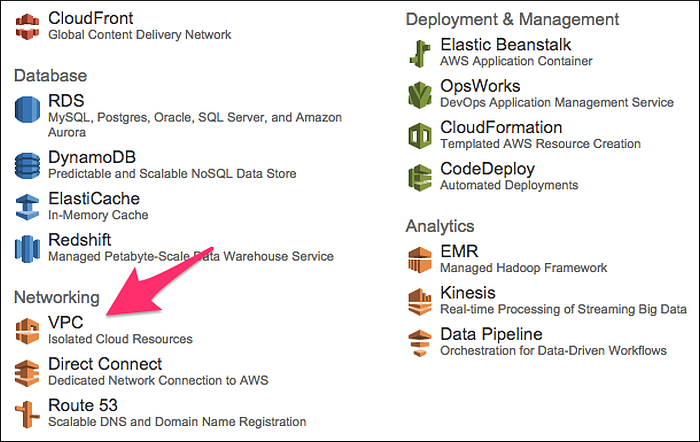 In the upper-right corner of the AWS Console, select a Region. 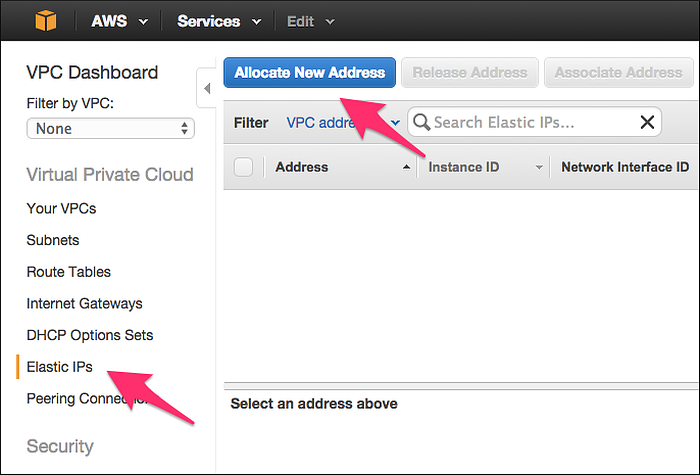 On the AWS Console, select VPC to get to the VPC Dashboard. Select VPC with a Single Public Subnet and click Select. Click Create VPC and click OK once VPC is successfully created. 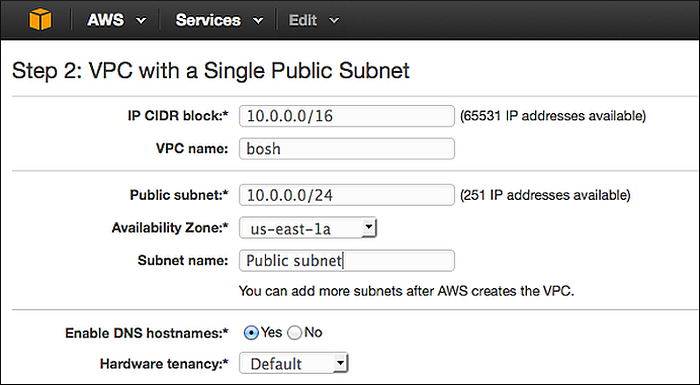 Click Subnets and locate the "public" subnet in the VPC. Replace SUBNET-ID and AVAILABILITY-ZONE in your deployment manifest with the "public" subnet Subnet ID, Availability Zone and Region (AZ without the trailing character). 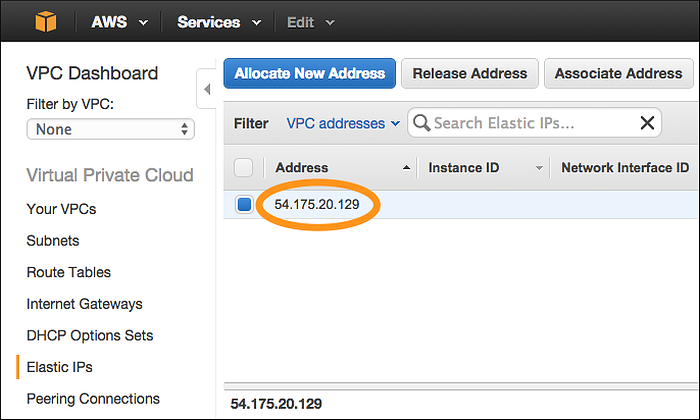 On the VPC Dashboard, click Elastic IPs and click Allocate New Address. In the Allocate Address dialog box, click Yes, Allocate. Replace ELASTIC-IP in your deployment manifest with the allocated Elastic IP Address. 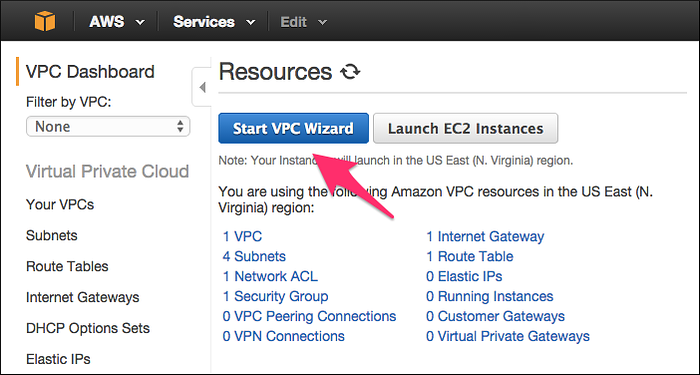 In the AWS Console, select EC2 to get to the EC2 Dashboard. Click Key Pairs and click Create Key Pair. In the Create Key Pair dialog box, enter "bosh" as the Key Pair name and click Create. Save private key to ~/Downloads/bosh.pem. 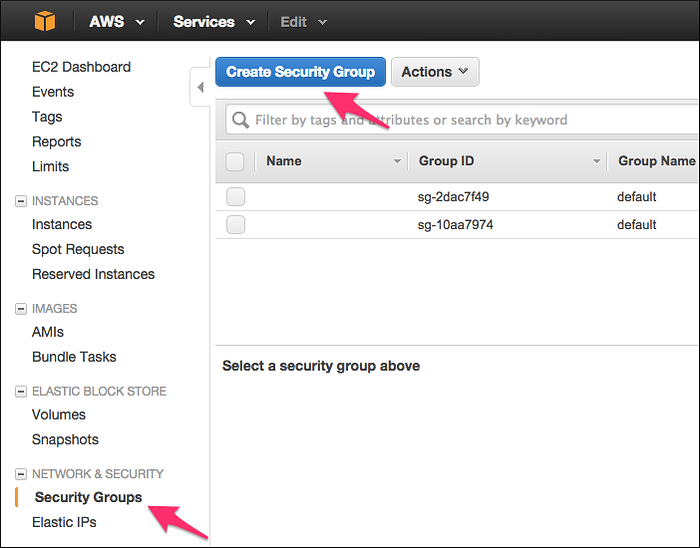 On the EC2 Dashboard, click Security Groups and then click Create Security Group. 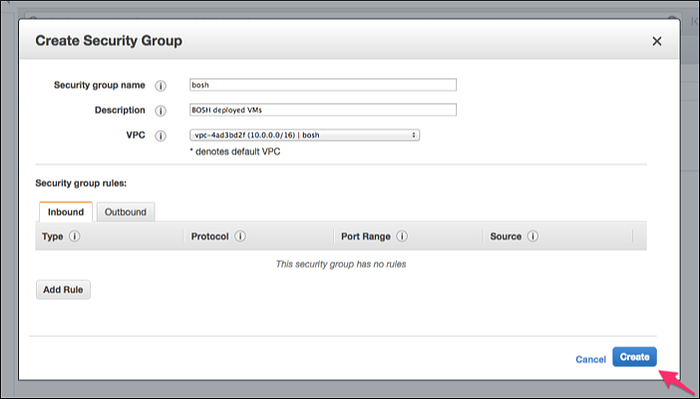 VPC: Select the "bosh" VPC that you created in Create a Virtual Private Cloud. Select the created security group with group name "bosh", click the Inbound tab and click Edit. Fill out the Edit inbound rules form and click Save. To enter your security group as a Source, select Custom IP, and enter "bosh". 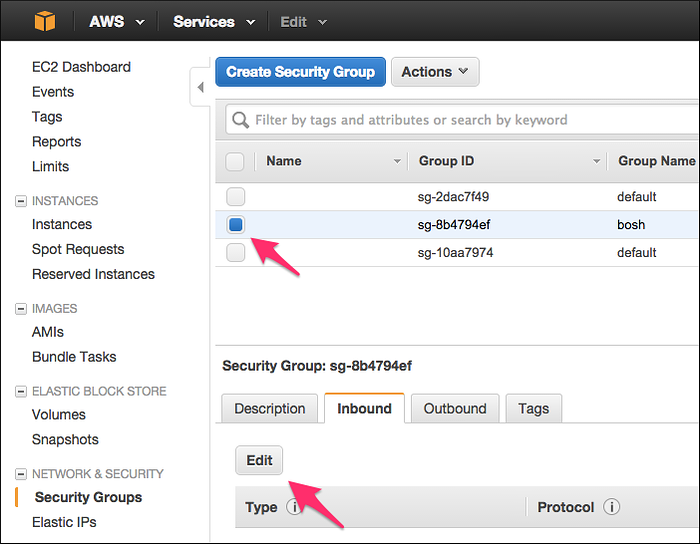 Note: The AWS Console should autocomplete the security group ID (e.g. "sg-12ab34cd"). If running above commands outside of an AWS VPC, refer to Exposing environment on a public IP for additional CLI flags. See AWS CPI errors for list of common errors and resolutions.